To start your 7-day private yacht charter Langkawi to Phuket we recommend you to arrive on the island of Langkawi or the island of Penang at least 1 day before departure. Relax after the long flight and get that pleasant vacation feel before taking on your sea adventure. In Langkawi, we recommend staying at The Danna Langkawi, the 5-star award-winning resort in the colonial style. In Penang, our all-time favourite is Eastern & Oriental Hotel. Built more than 100 years ago, it makes you feel back in the British colonial era with its stunning architecture and service. If you have chosen to start your cruise from Langkawi, then the departure point would either be Royal Langkawi Yacht Club on the south-east or Telaga Harbour on the north-west. On your cruise you will not miss any area mentioned below apart from Penang, of course. Starting from Penang there is a 3-hour cruise along the bottom part of the Malacca Strait, passing through the beautiful islands of Pulau Lembu and Pulau Payar. 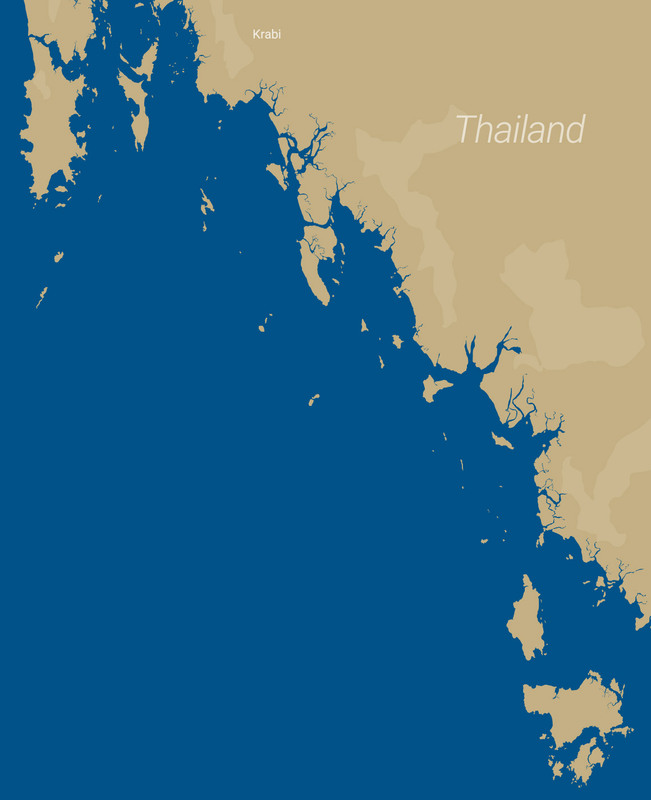 These 2 islands are part of the Malaysian Marine Park just off the southern shore of Langkawi. After a quick dip in the clear waters of these islands, you can then take the narrow channel that leads you to Royal Langkawi Yacht Club. Spend the rest of the day relaxing onboard or exploring the local villages, visiting duty-free shops and enjoying the local delicacies. 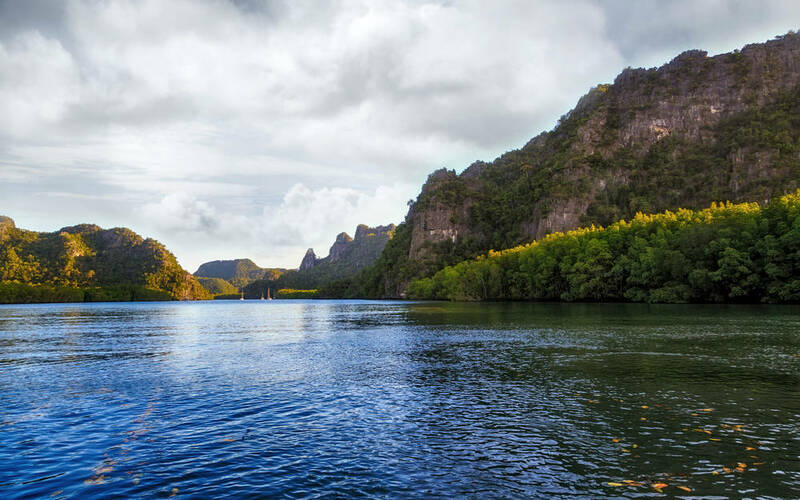 Another option for you would be to bypass the yacht club and cruise to the north-east for a scenic mangrove and limestone tour around Kilim Karst Geoforest Park, a 100 square kilometre nature reserve and a collection of geo-sites full of amazing flora and fauna. From here you can choose to head back to Royal Langkawi Yacht Club or to stay overnight at anchor in one of the local bays. Another day of your 7-day private yacht charter Langkawi to Phuket, and another pleasant choice. If your boat is based in the southern part of Langkawi then take a cruise down south to the island of Pulau Dayang Bunting famous for its freshwater lake that is believed to make barren women fertile. Mangroves and caves can be also called the island’s highlights. 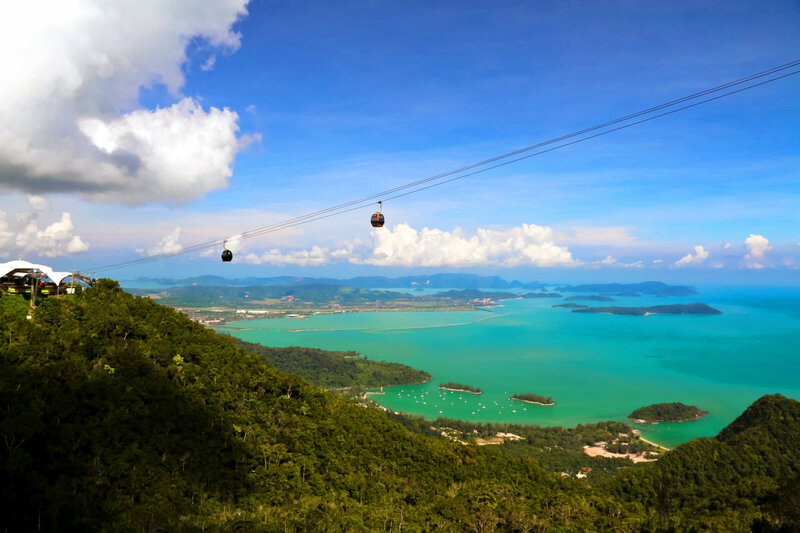 Starting your cruise from Langkawi’s north-east and moving further west you will see Tanjung Rhu Beach, probably the most beautiful beach on the island and Datay Bay, home to the most exclusive island’s resorts. Whichever coast of Langkawi you choose, your journey will end up in the beautiful Telaga Harbour Marina with a good choice of restaurants and The Danna Langkawi 5-star resort. If you still have time then don’t miss visiting SkyCab cable car that will take you to the top of the majestic Mount Gunung Mat (708m). The views of the island and Thailand from there are the most breathtaking in Asia. 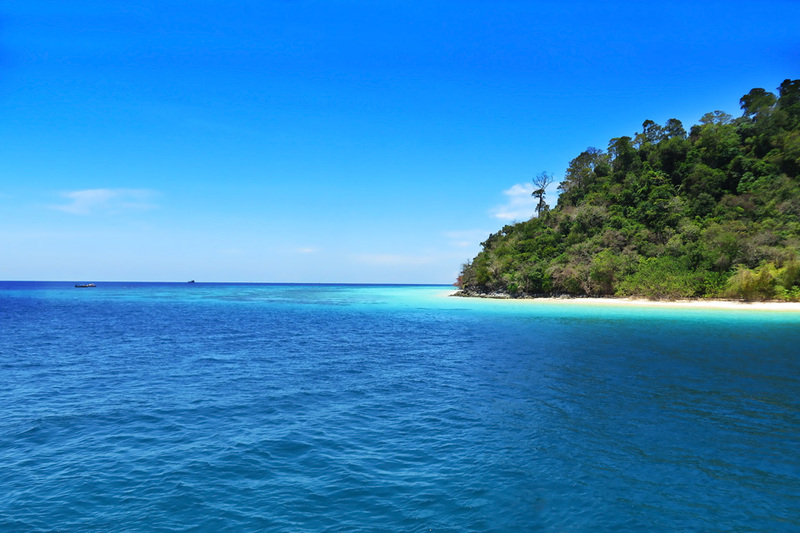 The following morning we will need to visit the Immigration Office right in the marina, as we would now be heading north into Thailand and Tarutao National Park whose islands are lying in the clear blue waters with marvellous snorkeling opportunities. 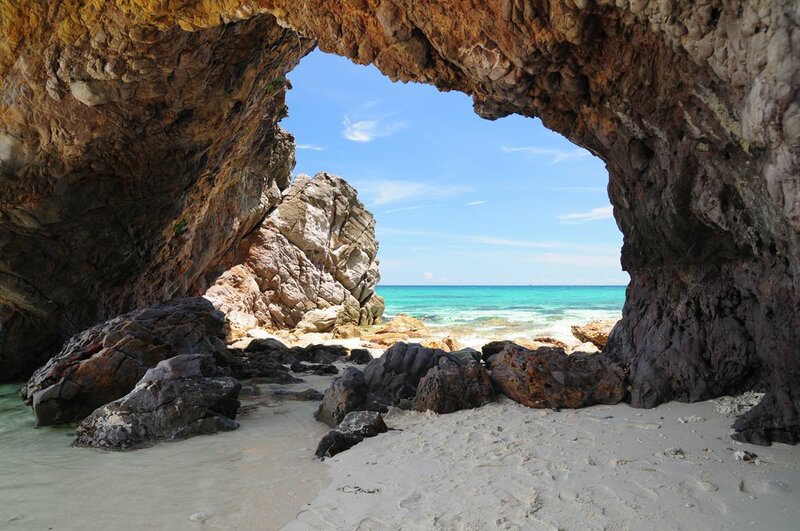 Step ashore on the island of Koh Kai with an unusual natural rock arch known as Lover’s Gate which bends itself from the shore into the sea. Carry on a relaxing cruising around the islands of Rawi, Adang and Lipe with their white sand beaches and coral reefs worth exploring with a snorkel. Spend the whole day in Tarutao National Park enjoying its treasures. You can choose to have lunch onboard and get ashore for dinner. 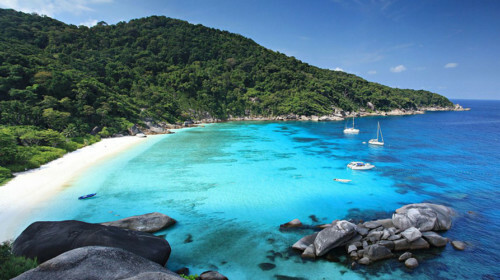 As well as spend a night in one of the calm bays on anchor or in a room of a resort on Koh Lipe. After a delicious breakfast and an energising morning swim, carry on your trip up north to the next paradise of Rok Islands. The 2 islands boast an impressive reef system that supposedly spans over a square mile in all. Visibility here is phenomenal. As well as the marine life – angelfish, pufferfish and anemones are most commonly seen in these waters. Enjoy your lunch on board and carry on the cruise to the island of Koh Muk and its spectacular Tham Morakot, or “Emerald Cave”. Swim there or use a kayak and you will get onto a small beach surrounded by the spectacular rocks covered with lush greenery. The island of Koh Lanta with its long sandy beaches and cosy bays will be the last leg of today’s journey. End the day’s cruising by dropping anchor for your overnight stop. This would normally be in an area that gives you easy access to the main Lanta Town with its numerous options of good restaurants for your evening dinner. Another option for you is to stay in one of the 5-star resorts mainly located on Lanta’s west coast. 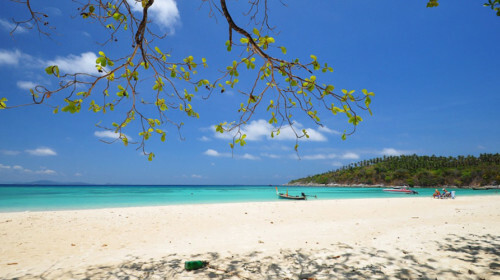 Choose an early start or a relaxing stroll along Lanta’s sandy shores. Either way, a 30-minute cruise to the west will take you to Ha Islands. 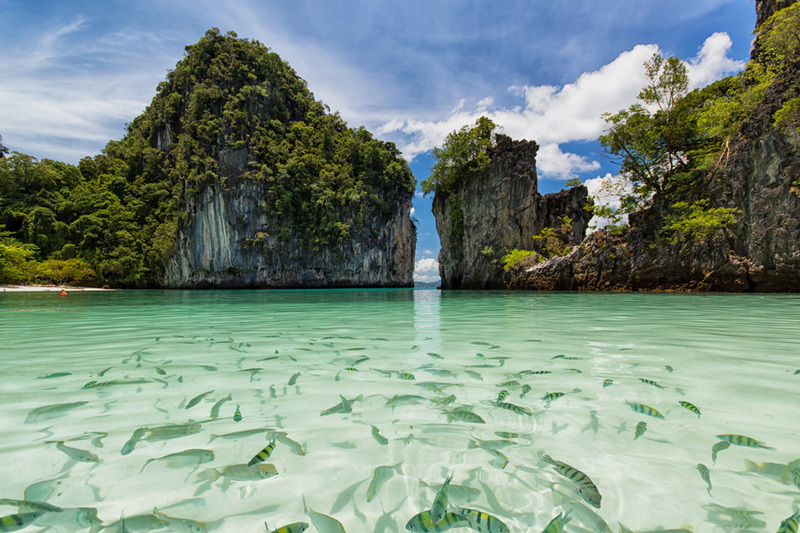 They are 5 small rocky islands (“Ha” is Thai for five) whose clear water and an abundance of colourful coral fish make them a popular snorkeling and diving destination. If you fancy diving then cruise further north to the small islands of Koh Bida Nok and Koh Bida Nai, home to plentiful marine life including turtles, moray eels and harmless leopard sharks. The famous Shark Point is situated south-east of Ko Bida Nok. 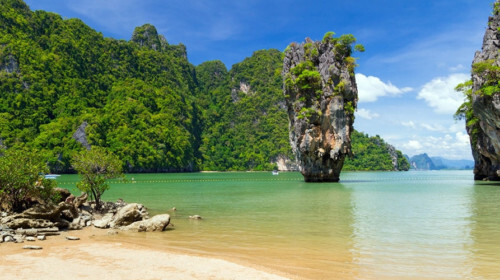 After a relaxing lunch aboard your private yacht, cruise to the scenic Phi Phi Leh Island and its emerald Maya Bay, the shooting location for the film “The Beach” featuring Leonardo DiCaprio. Cruise around the island enjoying the sights of Pileh Bay and Loh Samah Bay. Have a swim or go for some snorkeling. Spend the night in the comfort of the luxury yacht or take a break from the boating life by staying at Zeavola, the only 5-star luxury resort on the island of Phi Phi Don. Early hours on Phi Phi Islands are the best. Take a chance to get ashore before the tourist boats arrive and do a couple of memorable pictures against those fantastic rocks. 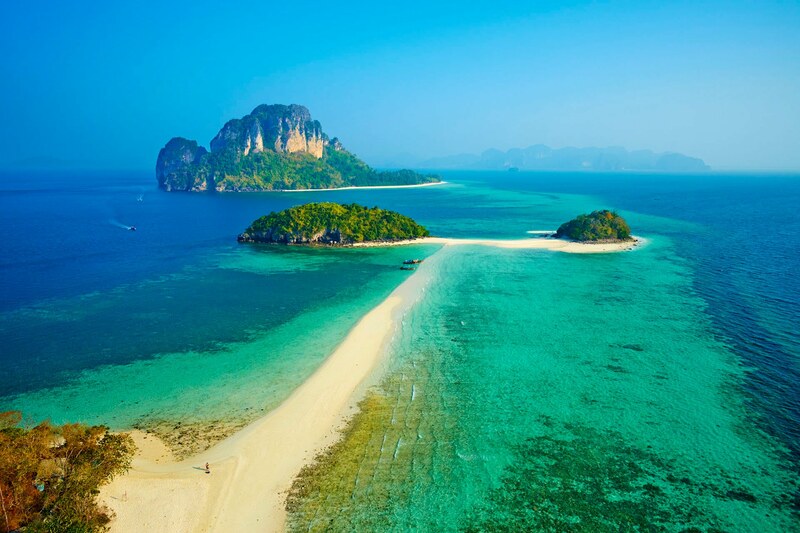 Your next destination will be Krabi Province and its 4 islands of Koh Poda, Koh Mor, Koh Tap and Koh Dam Khwan. Pay your attention to the island of Koh Dam Khwan – its rock definitely resembles the head of a chicken. And now it’s time for a delicious lunch onboard and a bit of chill out. After lunch carry on your trip to Railay peninsula which boasts as many as four white sand beaches, all within a walking distance from each other. The picturesque background of the rock cliffs cuts off the access to the peninsula by road. So the boat is the only way to get there. Have dinner in one of the beach restaurants or go for a fine dining experience in Rayavadee, one of the unique 5-star luxury resorts in Thailand. Overnight accommodation can be arranged for you there. Starting the last leg of your 7-day private yacht charter Langkawi to Phuket by heading up north to Koh Hong Island. Only a tender boat at high tide can get you to the secret lagoon hidden inside the island. The experience is unforgettable! But outside you’ll be stunned no less: the beach with coral fish is simply fantastic there. Moving to Koh Nok, one of Thailand’s secluded islands away from tourist trails. Very often you may have it all to yourself. Visitors often spot monitor lizards there. Don’t worry, they are harmless. It is also a good stop-over for lunch and chill out on board your private yacht before heading back to your drop-off point at either Phuket or Krabi. 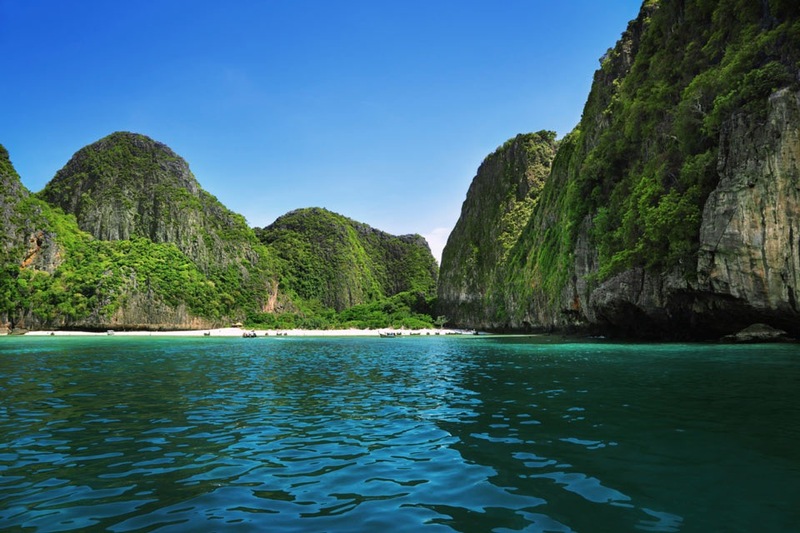 Contact Boat in the Bay to experience the 7-day private yacht charter Langkawi to Phuket. Other options on our 7 day cruise timetable would be to start in either Krabi or Phuket and to visit the locations of the Racha Islands, the Similan Islands, Phang Nga Bay, and the secluded beaches of Phuket.